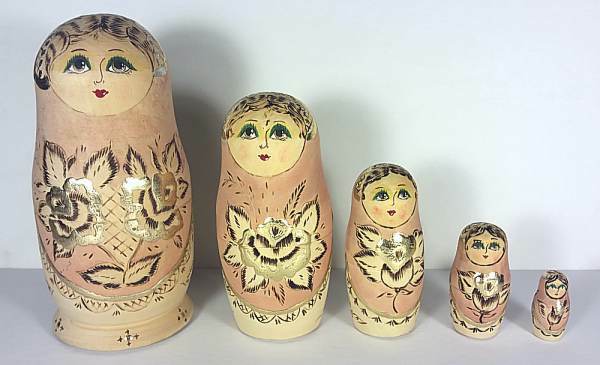 A pretty five-piece woodburned nesting doll set. The headware, flowers, and other decorative elements of the dolls are covered with protruding golden paint, creating a design that's at once rustic and rich looking. Details such as hair and flower ornamentation are carved. A very cute and traditional set. On the bottom of the largest doll, the artist carved out her name (Volodina), name of the city (Sergiev-Posad), and year of completion (1994).